CrazyC83 wrote: If the watch/warning program was used in Europe, we'd be at the point where a Hurricane Watch would be needed for parts of the British Isles. I know the British Caribbean uses them as well, but they are not run directly by the UK but rather by their individual territorial governments. That said, I'm not convinced it will be fully extratropical before at least strong winds reach the shores. tatertawt24 wrote: This really is like the second coming of 2005 where nearly every storm makes a name for itself by doing something weird and unexpected. Ophelia is reminding me most of Vince. In some ways 2017 is more active than 2005. 2017 has more ACE/Storm and is one standard deviation above the mean. 2005 and 2017 are within average. 2017 has higher percentage of hurricanes becoming major hurricanes. It is one standard deviation above the mean. 2005 is within mean of hurricanes becoming major hurricanes. 2017 is one standard deviation above the mean. For those in the UK and Ireland, Euro model predicting significant wind gusts as this moves by. Unfortunately I can only find this graphic in MPH rather than KPH. This are wind gusts, not steady winds, and this is just one model. Man, where *is* KWT these days? One thing I've noticed when browsing historical storms is that this should hit Ireland at a lower pressure than mostof the deadly winter windstorms in Euro modern history. I wonder if we should be more concerned about impacts in Ireland and Scotland than we are. Bad or not, if it manages to remain a TC on arrival, they may request it just for historical significance. No, since Ireland is not on the RA IV Hurricane Committee. The UK, however, is (for their Caribbean territories). CrazyC83 wrote: What are the chances this could become a major hurricane? Has there ever been one that far north and east? 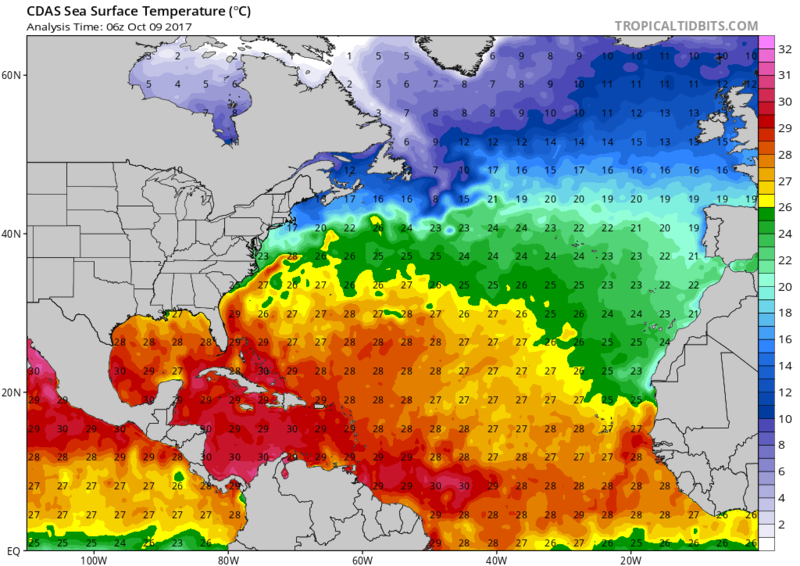 Pretty unlikely due to marginal sea surface temperatures. Cold upper level temperatures are helping to offset that (<-60ºC at 200 mb), but not enough for more than a lower end hurricane in my opinion. Well, this aged well. Here's your periodic reminder that meteorology is hard. I mean, to be fair, it is totally unprecedented... by like ten degrees of lat/long, so I doubt anyone realistically expected it. It's also only the seventh known storm in the satellite era to develop from non-tropical origins and become a major hurricane, and the first that I can tell that originated from a previously extratropical system. The others: Alicia 1983 (from remnants of MCV), Diana 1984 (from stalled front? ), Bob 1991 (from stalled front), Claudette 1991 (from upper level low), Michael 2012 (from confluence of energy) and Joaquin 2015 (from upper level low). this isn't real. this wont be a storm by the time it reaches ireland. And if it does throw the book out...because hurricanes dont need warm water. SEASON_CANCELED wrote: this isn't real. this wont be a storm by the time it reaches ireland. Ophelia is so far north and east that it's totally fallen out of the wide view ... can't remember ever seeing that before! Ophelia crossing 20W and heading NE as a major hurricane. This makes me think - can the Mediterranean spawn a major hurricane? CrazyC83 wrote: This makes me think - can the Mediterranean spawn a major hurricane? 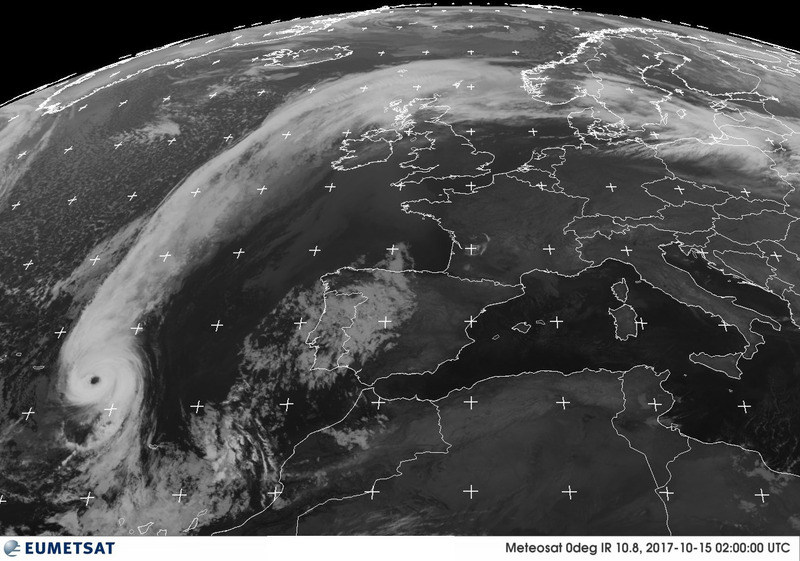 As of midday Saturday, Hurricane Ophelia situated at approx. 2,500km southwest of Ireland and 500km south-southwest of the Azores in the Atlantic Ocean is currently tracking east-northeast. The latest information from our colleagues in the National Hurricane Centre in Miami indicates that Ophelia will become a powerful post-tropical cyclone (from thereon in ex-Hurricane Ophelia) by Monday, and there is now generally high confidence that the centre of this system will track close to and possibly even over some parts of the west coast of Ireland. Ex-Hurricane Ophelia is expected to be near the southwest tip of Ireland by Monday morning. From there it looks set to track northwards close to the Atlantic Seaboard at a fast pace to be roughly situated 100-200km northwest of County Donegal by midnight on Monday. This will be a significant weather event for Ireland with potentially high impacts – structural damage and flooding (particularly coastal) - and people are advised to take extreme care Keep up to date with the warnings. Met Éireann forecasters have been monitoring this situation closely all week. We have been liaising with our international colleagues, especially at the UK Met Office, and as we are now in the 48 hour window, with access to our high resolution models, we have decided to issue specific warnings. The warnings will be updated as required. For further information on the evolution of this system, please continue reading. 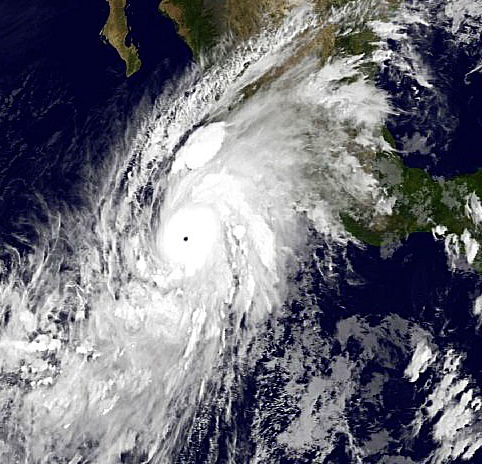 What will happen with Hurricane Ophelia? Hurricane Ophelia is expected to undergo an extra-tropical transition over the next 24 to 36 hours. That means its structure and appearance is going to undergo drastic changes as it approaches Ireland. It will lose its hurricane status but will become a powerful extra-tropical storm. Current indications are suggesting that Ex-Hurricane Ophelia will likely engage with an upper trough of low pressure in the mid-Atlantic at some point tomorrow afternoon. This engagement will cause the storm system to accelerate somewhat north-northeast towards Ireland and the UK. As Hurricane Ophelia tracks north from its current position, it will encounter cooler seas and it will eventually come under the influence of the westerlies. The westerlies of the mid-latitudes increase in strength with height, a phenomenon known as vertical wind shear. This shear almost literally chops off the upper part of the hurricane and sweeps it away. Along with the lower sea temperatures of the mid-latitudes this destroys the positive feedback processes within the hurricane. What remains is the former hurricane’s low-level circulation which, if conditions are right, becomes the focus of further development. Rain can be expected over the country on Sunday night and into Monday, though the heaviest and most significant rain will remain out to sea in the Atlantic on the western side of the surface low pressure. But there will also be some heavy and possibly thundery bursts rotating around the low centre itself, so it can be reasonably assumed that counties closest to the centre of the low will see the heaviest rainfall. At the same time, damaging winds will accompany the low centre with wind gusts of 130km/h or more. The most severe winds will be in coastal counties, with lower impacts likely for central areas. In addition, we can expect very high waves. Sea conditions will be dangerous and large waves may lead to coastal flooding. The Azores really dodged a bullet here. They could have been hit by a cat 2 or 3 storm if Ophelia hadn't been so far south. Also if anyones curious, the last time Ireland was hit by a fully tropical hurricane was in 1961 by Hurricane Debbie as a category 1 storm transitioning to post-tropical. Debbie was even a major hurricane just a bit west of where Ophelia is. This is definitely a once in a century type of storm even if it isn't fully tropical when it strikes. Will be very strong regardless. Ophelia always has something to talk about every time she surfaces. 2005 - her indecisiveness over the Carolinas led to a very interesting couple weeks.